NOTE: This ring set can also be ordered in sterling silver. 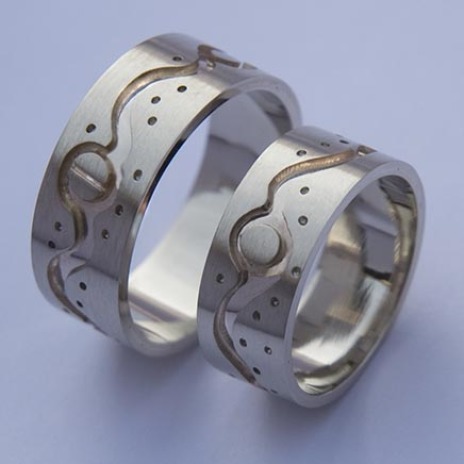 The title, the stylized design as well as the color of these overlay wedding rings, which relate to a free flowing river by moonlight, are a romantic metaphor for our spirit. Our spirit which, despite all ‘rational’ constraints and limitations we tend to create for ourselves, is essentially as free as the flight of a bird – or the course of a river. The orbs (moon symbols) that are connected by means of a free-flowing ‘spirit’ line symbolize illumination and enlightment. Naturally, the serene character of the rings and the round moon symbol inlays also have a meaning that goes far beyond what it initially appears to be. Native people know that everything in Creation has spirit. The plants, the trees, the water, the wind, the rocks and the mountains have spirit. The sky world, including the moon and other planets, has spirit. All of these are part of our first family, the natural world. "The moon is called Grandmother Moon, and great respect is given to her. In the Anishinaabe world, she is referred to as Wezaawigiizhigookwe, Yellow Sky Woman, our Grandmother Moon. The cycles of the moon determines our yearly calendar. The changes that come with each of the passing moons indicate the times for planting, harvesting, hunting and gathering. In the Anishinaabe Calendar, the names of each month includes the word “Moon.” These names reflect the close connection between the cycles of the moon and the plant and animal life on Turtle Island. It is said that Grandmother Moon watches over the waters of the Earth. We see this in her regulating the tides. Grandmother Moon controls all female life. Much of the water life spawns according to the cycles of the moon. Just as Grandmother Moon watches over the waters of the Earth, it is said that women watch over the waters of the people. Water always comes before new life. It is said that the moon cycle is a gift to women. It is a time to cleanse herself mentally, physically, emotionally and spiritually. The moon time is considered a time of power, second only to the ability of the Great Mystery to give life. That is how strong that power is. Women can ask Grandmother Moon for direction in life, for wisdom, and for help for her children and others. Grandmother Moon can give her healing and balancing energy to women. Some teachings say that when the moon is full, women can ask Grandmother Moon to give them energy. Around the full moon, women on their moon time become very intuitive. It is an opportunity for women to take time for themselves to help foster their intuition and to have strong dreams. When the moon is full, a woman can do a ceremony to honor and seek guidance from Grandmother Moon. The ceremony can be simple. A woman can sit on the ground and ask Grandmother Moon to replenish her body with new energy. She takes water with her when she asks the Moon to bless her. The water then becomes her medicine.